With the recent whistleblower scandal revolving around the NSA’s ability to literally wiretap anyone, we figured now would be a hell of a time to brush up on some of the more “Big Brother Government” novels if only to prepare for what’s surely around the bend. And, according to Amazon’s sales records, we weren’t the only ones to think so as sales for George Orwell’s 1984 exploded by 69% over past few days. We’re willing to bet that our avid readers have more than likely consumed most, if not all of the books on our list here. However, in light of these recent events, we think now would be a rather poignant to revisit these classics and apply their messages to our own brave new world. 1984 tops our list for obvious reasons. Hitting the nail on the head in terms of constant surveillance and utter disregard for privacy, 1984 coined the phrase “Big Brother,” which now is resonating through search engines across the internet. 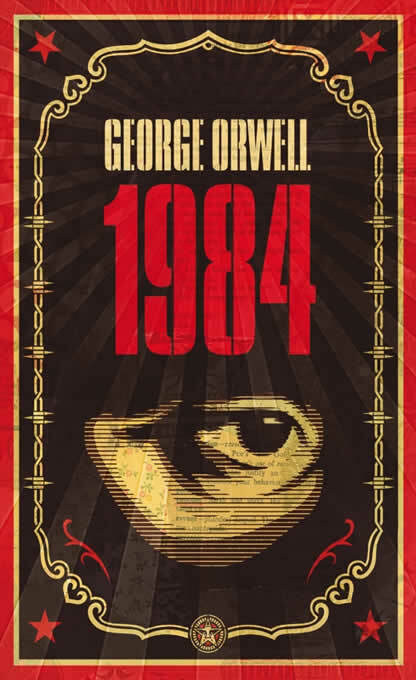 1984 gave us a terrifying glimpse a future of totalitarianism and unrelenting government control. And as more and more digital recording devices are placed within households around the world (we’re looking at you XBox One) we can actively watch as this work of fiction is transformed into a how-to manual by the powers that be. Often found wandering through reading lists hand-in-hand with 1984, Brave New World seems to take all that was rough and tough and dark in 1984 and transform it into a haze of controlling pleasure. This novel, as well, holds a great amount of weight in its social commentary about the pleasure-seeking masses of civilization and the sedentary lifestyles of much of the first world populations. As this comic by Recombinant Records perfectly illustrates, Brave New World is just as, if not more so applicable to our state of existence. V for Vendetta is a fantastic piece of literature. A graphic novel that ingrains itself within a brutal dictatorial reality, V for Vendetta epitomizes the fantastic necessity of vigilantism to such a degree that it has become the face of underground movements around the world today. In fact, the Guy Fawkes mask is almost synonymous with the online (and now often offline) vigilantes known as Anonymous – a group of “hacktivists” who conduct cyber warfare with corporations and individuals of ill repute. This all spawns from the character V, within whom an inferno of revolutionary scale erupts, such to the point that he cannot be contained within the pages. Just as relevant now as it was when it was published in 1953, Fahrenheit 451 takes a nasty bite at mandated censorship and ignorance within global communities. Focusing, much like Brave New World, on the pleasuring of the masses, the government has made the reading of books outlawed. And with that comes a loss of not only culture and creativity, but also critical thinking – a cornerstone of civilization that has already been lacking too much of late. Never Let Me Go is a very different book than the others on this list. With almost no violence and a story that slowly meanders through the quiet lives of individuals destined for a tragic end, Never Let Me Go invokes a deep sense of sorrow rather than revolution. And it is in this way that the novel makes its most profound points about the fragility of individualism and the effects of time in a world where lives are thrown away far too easily. These are but a few in a long line of incredibly poignant and provoking works of art that have quite a bit to say about encroaching governments and loss of identity. Novels such as The Handmaid’s Tale, The Giver, and Persepolis offer readers a chance to understand a world of oppression without having to explicitly experience it, acting as eye openers and pushing readers to realize the precarious positions many of us are in. What are your favorite dystopic, government-fueled novels? Did you like our list, or was there something you think should have been included? Let us know in the comments! Without a doubt…… Atlas Shrugged by Ayn Rand.